Droplet condensation in the atmosphere Suspended droplets form by the condensation of water vapour. There are two distinct ways for this to happen: vapour cooling, vapour mixing. For a discussion of these processes, see the page on condensation. The steam fog treated here is produced by vapour mixing. 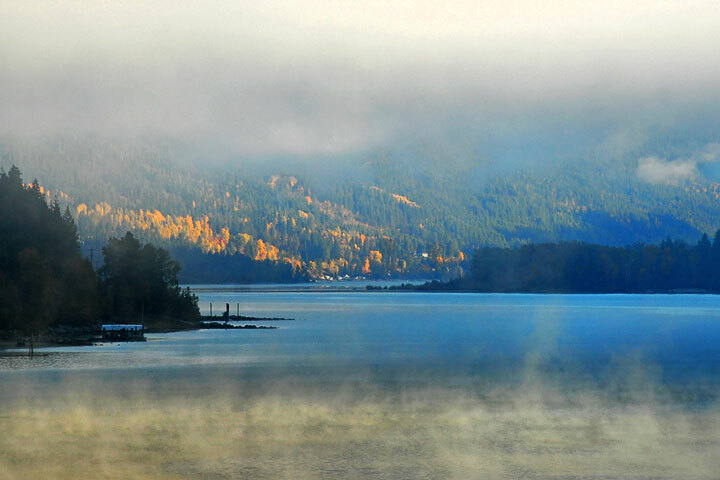 Steam fog is a frequent visitor to the surface of Kootenay Lake in the fall and during a cold outbreak in the winter. Steam devils are far less frequent, but well worth the wait. Steam fog is produced by the mixing of two parcels of vapour, each of which has a humidity less than 100%, yet the resulting mixture has a humidity greater than 100% and so condensation results. For this to happen, the vapour parcels have to be at markedly different temperatures. But, what are the two sources of the vapour? One is the ambient cold air flowing over the Lake. The vapour in it has a high humidity but one that is a bit less than 100%. The other source is the bottom centimetre of the atmosphere just over the water’s surface; it has been warmed and moistened by the (relatively warm) lake surface, itself. Convection in the bottom centimetre to meter of the atmosphere then mixes these disparate vapour sources resulting in a humidity of greater than 100% and condensation—steam fog. 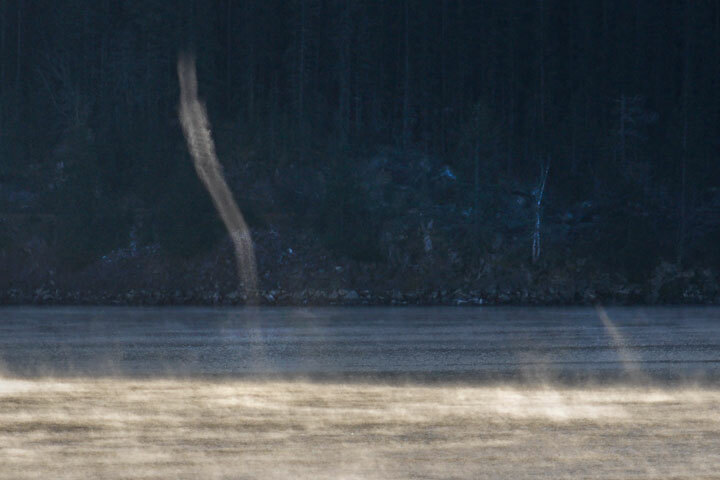 Devils Whirlwinds close to the surface—dust devils, snow devils, steam devils—all arise from the same basic physical processes. The rotation arises from the wind shear (the variation of wind with height) in the lowest meter or so of the atmosphere. The rotary motion, initially with a horizontal axis, must be bent up and stretched for the whirlwinds to form. 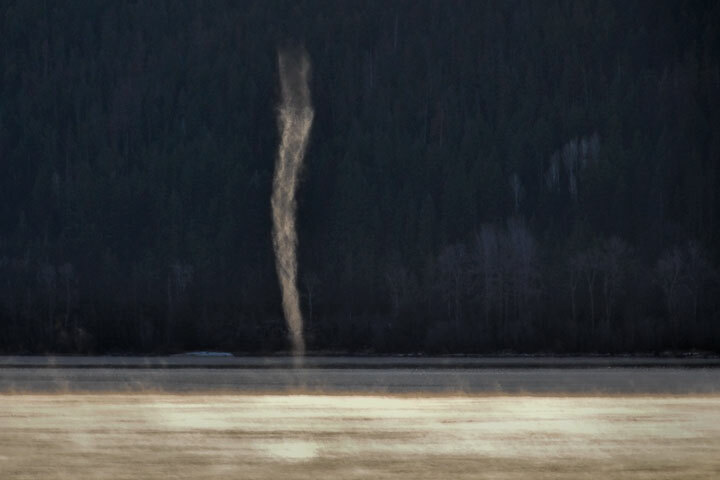 For dust devils and steam devils, this is usually accomplished by convection; with snow devils, it is usually accomplished by irregular terrain. Why call these whirlwinds devils? Devil is from a Greek root meaning to throw. Satan earned it by throwing slander. The dust devil earned it by throwing up dust. The whirlwinds, seen below as steam devils, probably occur more often than they are seen—there will not always be steam fog available to make the vortex visible. Their formation requires wind (actually wind shear—see box). 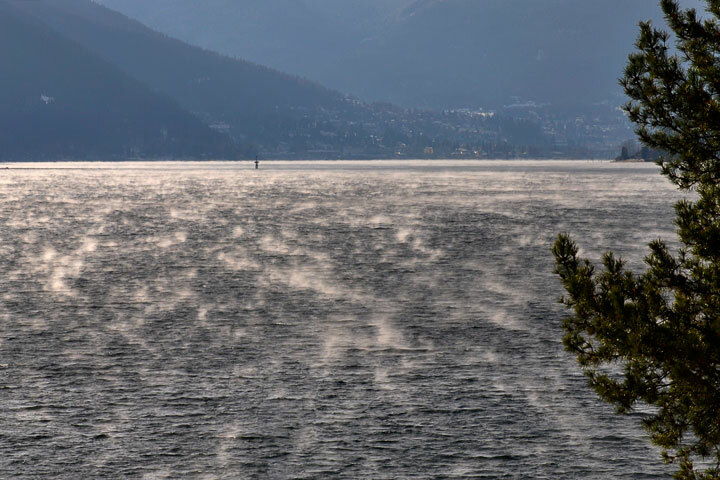 Now, steam fog on the Lake is virtually always accompanied by winds, but usually the winds are remarkably light, such as the cold air gently draining down from the surrounding land. Such drainage winds will produce steam devils, but tiny ones a centimetre across and maybe only a meter in height. The bigger steam devils seen below require something brisker than drainage winds: a distinct breeze blowing along the Lake. A note about the photography: Steam fog and steam devils show their best contrast when they are backlit against a dark background. For this, a view from the North Shore of the West Arm is good. The winter sun rises over the steep mountains to the south and brightly illuminates the Lake surface, but the south shore remains in the shade. Even though the underlying process of condensation is the same for steam fog over the Lake as over the land, both the meteorological situation and the appearance is sufficiently different to warrant a separate page to treat steam fog over the land. 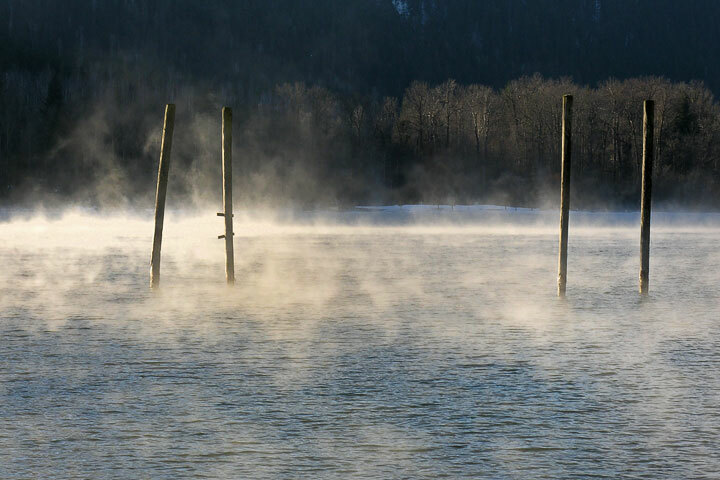 Steam fog Evanescent sprites dance in the cold air over the surface of warm water. 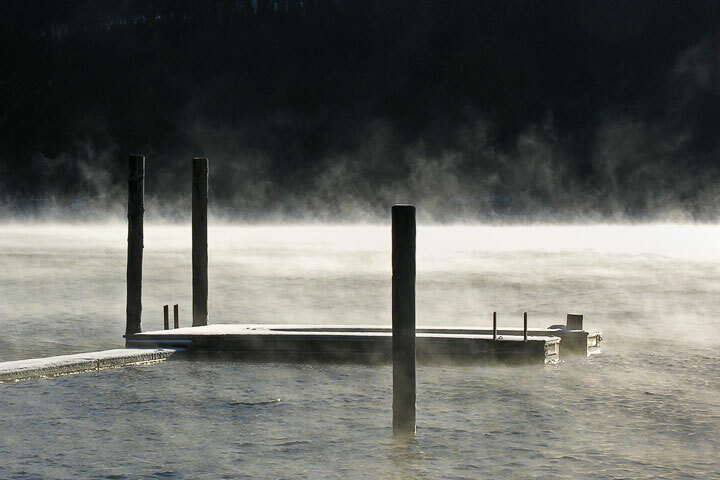 Steam fog is most likely on clear calm mornings in the fall and winter when gentle and shallow drainage breezes bring the cold air from the sloping shore out over the warmer Lake. It can vanish quickly with the Sun—which warms the ground and so stops the drainage winds. 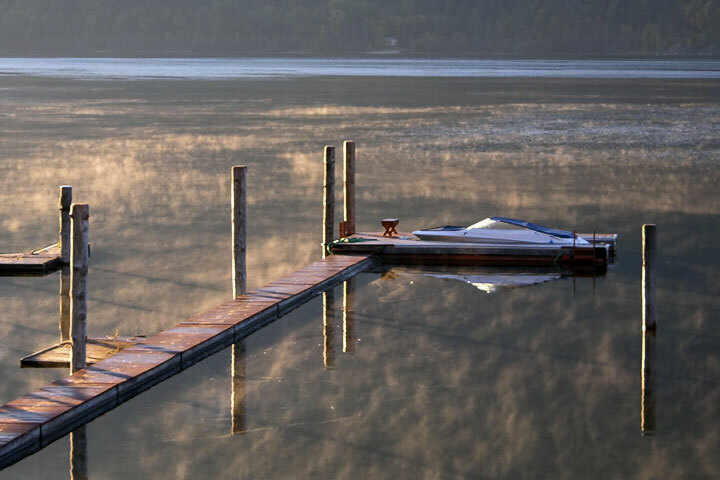 Although the process which produces the steam fog over the Lake is the same as that which produces it over a pot of boiling water, it remains that the Lake water is not boiling. It is, in fact, rather cold—albeit significantly warmer than the air. The visibility across the Lake from the water’s edge is very low. Steam fog moves over the Lake in this view from Duhamel, looking towards Nelson. Fall brings many things to the Lake, stratus, autumnal leaves, and steam fog. This view is toward Troup from the Nelson bridge. Steam fog While the main season for steam fog is the fall when it is typical for cold air flows over the summer-warmmed Lake, it can be seen almost anytime. 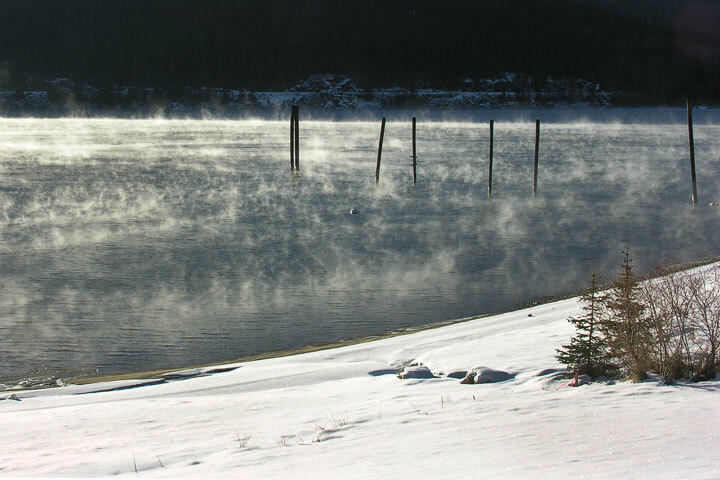 As the surface virtually never freezes (except a tiny fringe along the shore), any cold outbreak of air can cause steam fog. 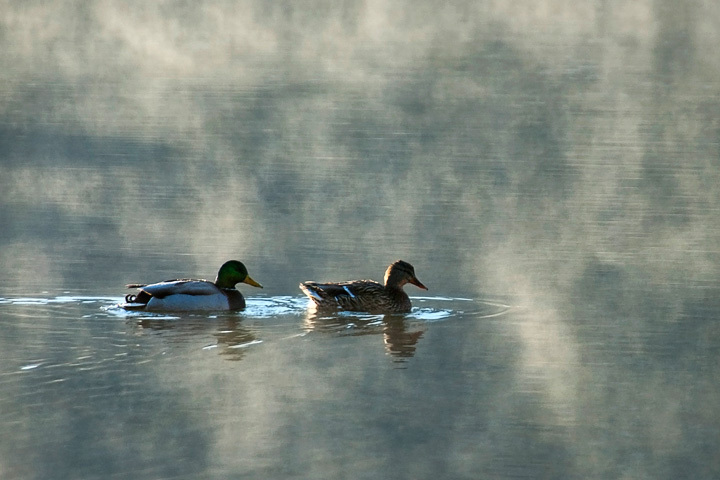 These mallards are swimming through it in early March. Steam fog A cold spell in January prompts the Lake to be covered with steam fog. Steam devil Just as one can have dust devils—whirlwinds made visible by dust—so too one can have steam devils—whirlwinds made visible by the drops of steam fog. The steam devils came and went quickly, but often quite a number of them could be seen at once in any particular direction. The seemingly hollow appearance is characteristic of many whirlwinds such as dust devils, water spouts, and tornadoes. 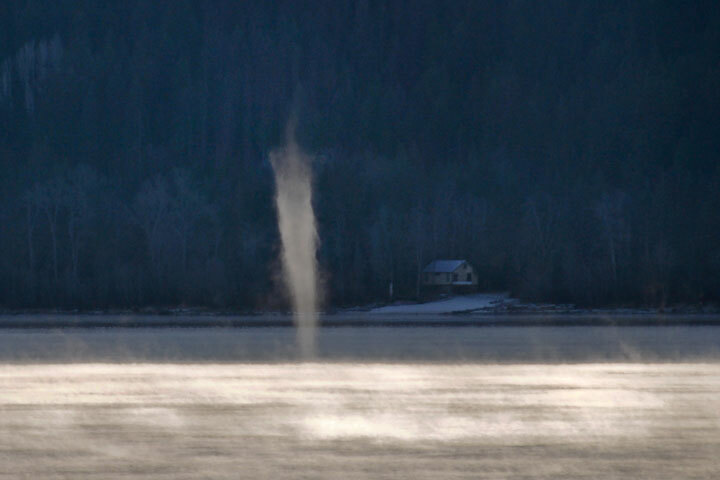 A boater on Kootenay Lake would not normally expect to encounter anything like this. 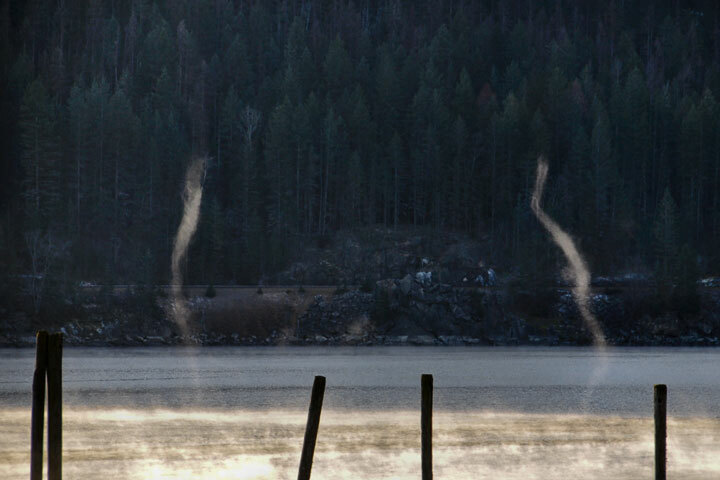 Yet, these are not water spouts; they are steam devils, and should pose no threat.